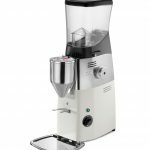 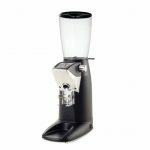 The Compak PKF features 80mm burrs and a 800-watt motor and a portafilter holder built onto a load cell mounted to the front of the grinder. 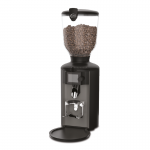 The flat burrs turn at a low of 350rpm minimising heat transfer to the beans. 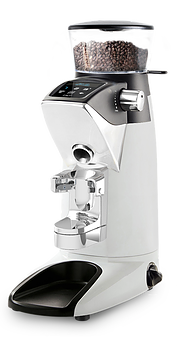 The load cell converts the downward force of a portafilter into an electrical signal in the manner of a hanging scale, and then computes the data from there. 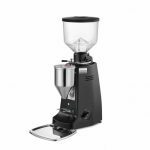 By placing the portafilter into the holder, Compak’s onboard system converts the downward force of a portafilter into an electrical signal, automatically tares its weight and then dispenses the user-designated dose accurately to within tenths of a gram. 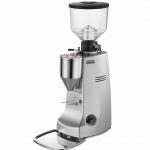 The PKF features a knob on the side, geared for greater precision and to display the grind setting as a numerical value on the grinder’s screen, which users can store in order to manually return to that exact setting later.